The present painting comes from the hand of the painter Walther Firle. It was created circa 1884 after a stay of the artist in Holland. In The Hague he saw a group of orphan girls whose pious singing charmed and inspired him to draw. Back in Munich, Firle created the first large works of his sketches and studies. Shown is a young girl in black dresses with white scarves, aprons and open hair, singing here in a room of music sheets, one of them playing the piano. The scene is bathed in a soft morning light shining through the large windows. Oil on canvas Netherlands, circa 1884 Walther Firle (1859-1929) portrait and genre painter Signed lower left "WALTHER FIRLE". Portrait of man with hat circa 1900 oil on canvas. 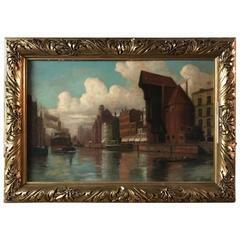 Oil Painting, fine Painting of the City Danzig in Poland Frame gilded. Dimensions with frame: Width: 108 cm Height: 78 cm Dimensions without frame. Width: 86 cm Height: 56 cm. Painting oil painting. Castle on a hill overlooking the sea. Signed. P.A.Buchhorn Z. hoven Painted oil With original frame, circa 1930. This is a nicely framed mid-20th century sunset coastline seascape oil on canvas. Semeraro painter oil on canvas Italian pastel colors 1970s Metaphysical, Italian artist.